…is to have you leave with a full understanding of how the exercises you are shown fit into a horse’s training progression, from the beginning to the highest levels of riding. We will be teaching you methods at a level that you and your horse can accomplish, and will also demonstrate how these skills fit into advanced maneuvers. Please embrace the idea that you will be studying ideas and concepts currently out of your reach. This is not a criticism of your ability or potential. We will show you areas where you and your horse need improvement, not to focus what is lacking but to show you what is possible. Our goal is to make you the best horseman you can be. We believe this awareness will help you the most long-term. The exercises we show you will have immediate results during the clinic. The biggest challenge you will face during the clinic will be muscle memory. It takes time and repetition to create and/or change muscle memory. You will achieve the best results when these methods are practiced at home to create new habits. At the clinic, the horses often wonder why their human is suddenly behaving differently. It is our responsibility, as well as yours, to remain compassionate while making these changes. Many of the exercises require physical exertion, so please be sure to bring a fit horse. We will also show you exercises that challenge you and your horse more mentally than physically. These exercises are more detail oriented and the changes seem smaller but are incredibly valuable. 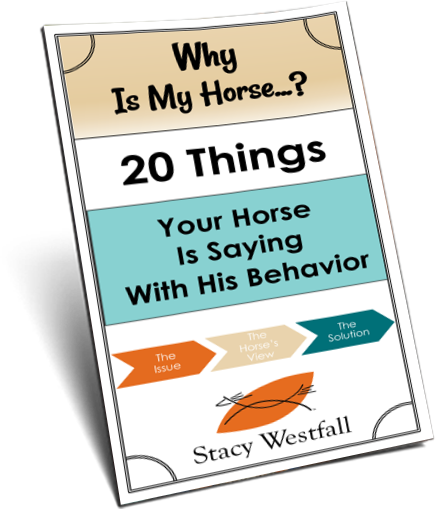 Not only do they preserve your horse’s energy but they also change the way that he thinks. These are often the most overlooked areas of horse training. PLEASE BE ADVISED: THIS WAS THE 2018 SCHEDULE. THE 2019 UPDATES HAVE NOT BEEN MADE YET. CHECK BACK OR EMAIL US WITH QUESTIONS. Wednesday-3-6 pm. Arrive, settle horses, check-in. We will give you a cell phone number to keep in touch with us during your travel. 9 am- Individual horse and rider evaluations. These will be recorded for review later. Stacy and Jesse will be riding at 8 am, feel free to begin warming up as early as 8:30…but pace yourself, you and your horse have a long weekend ahead! 9:45-10:30 Demonstration: Exercises to improve physical and emotional control in both groundwork and under saddle. 2-2:30 Shoulder Control Demonstration: How Simple Exercises Lead to Advanced Maneuvers i.e. lead changes, spins, rollbacks & neck reining. 2:30-4:30- Riding session: Group and individual coaching on shoulder control exercises. 2:30-4:30-Riding session: Whoa exercises. Continue practicing shoulder control exercises from yesterday. 9-10 am- Final groundwork session: challenge course. 10-10:30- Demonstration: Moving haunches and combining shoulder and hip control to create high-level maneuvers such as shoulder in, two tracking, haunches in and lead changes. 10:30-12 pm- Riding session: coaching on hip exercises. Stacy & Jesse will coach you on how to combine these exercises with the shoulder control exercises. 2-4:30- Riding session: Warm up in the arena using exercises you have learned. Weather permitting, trail ride in State Park. If the weather is bad, indoor games! During either, Stacy & Jesse will be answering questions and showing you how the exercises apply in various circumstances. 10-12- Final ride time with Jesse & Stacy. Open riding, closing questions & opportunity to repeat the original evaluation. ….special area events and opportunities unique to each clinic are not listed here. For example, if your clinic is during a Full Moon we may be offering a Full Moon trail ride, local barn dances or other festivals may be going on outside of clinic times. Watch for updates.